The topography here consists of a 2 meter deep reef sloping down to a terrace around the 70 meter mark which then drops off into the abyss. 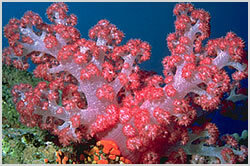 As its name implies this site is great for viewing soft corals with dendronephthya alcyonarians in various pastel colours covering the slope. Check out the cracks and crevaces for macro life and always keep an eye out for bigger visitors.